WALPOLE, N.H. – The 2017 Granite State Pro Stock Series season saw one driver work himself back into championship form. Springfield, Mass. native Mike O’Sullivan never visited Victory Lane, but that didn’t matter much when it came to the fight for the title. O’Sullivan finished seventh in the finale at New London-Waterford Speedbowl and that was enough to clinch him his second career championship on the Granite State Pro Stock touring series. O’Sullivan Returns To Title Form: Mike O’Sullivan had been a champion before on the Granite State Pro Stock Series. The Springfield, Mass. driver entered this season hoping to return back to his prime form – and in the end – he completed his goals. A long summer and a lot of hard work ended with O’Sullivan celebrating the championship come the finale at the Speedbowl on Oct. 21. He crashed out of the Thompson World Series race and went into the season-finale at Waterford needing a ride. His bother, Tommy, gave up his car and Mike finished the season and the championship driving his brother’s machine. It was a true family effort. MacMichael Takes Rookie of the Year Title: The 2017 season saw Scott MacMichael sit behind the wheel of a Pro Stock for the first time in his career. Even though he had competed in Late Models and Modifieds in the past, this marked a new venture for the Newbury, N.H. driver. Even though he didn’t have much experience — the season ended up going well. He finished as the Rookie of the Year in the series, which was one of his goals at the outset. However, much to his surprise, MacMichael found himself entering the final race of the season with a shot at the championship. He entered the finale at New London-Waterford Speedbowl just four points from the lead, but obviously, things didn’t go his way. Even still, a second-place finish in points in your rookie season isn’t half bad. If he returns for 2018, he will immediately be one of the drivers who will be a threat for the title. Gray Remains Winless: The 2016 Granite State Pro Stock Series champion Barry Gray gave up his crown in 2017 and still didn’t visit Victory Lane. The Belchertown, Mass. driver had won the title in 2016 without winning a race and it looked as though he might be on a path to do that once again this year. However, a rough summer stretch that included multiple finishes outside the top five ended up forcing Gray to try to gain ground in the season’s final two races. He wasn’t able to accomplish his goal of winning a second straight title, but he did end the season third in the standings. FIRST-TIME VISIT TO NHMS: When the announcement was made over the offseason that the series would visit New Hampshire Motor Speedway, drivers were ready to tackle the one-mile oval. In the First Annual New England Short Track Showdown, 26 cars showed up to Loudon and in the end, it was Eddie MacDonald picking up the victory. MacDonald struggled in the first half of the race, but came on strong after a break at halfway and was unbeatable in the final circuits. DJ Shaw finished second, while NASCAR Whelen Modified Tour regular Matt Swanson invaded the series and finished third. The event was a success and will return for the 2018 season – more details on that will follow over the offseason. WINNING: Only one driver was able to visit Victory Lane on multiple occasions this season. Joe Squeglia scored three victories behind the wheel of his No. 03 – winning at Lee USA Speedway, Star Speedway and New London-Waterford Speedbowl. Other than him – there was a mix of first-time winners and veterans returning to the winner’s circle. Jeremy Davis started the season with a victory at Lee, while Mike Mitchell rolled into Riverhead and captured his first career win in race two of the season. After that, Tommy O’Sullivan and David Darling went to Victory Lane at Claremont and Seekonk. 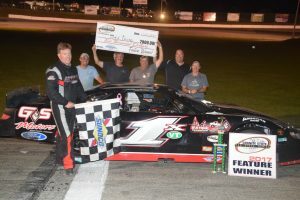 In the First Annual New England Short Track Showdown at New Hampshire Motor Speedway, Eddie MacDonald added to his impressive NHMS resume once again with a victory in the 50-lap feature. Squeglia won his first race of the season at Lee and then Todd Stone rolled into the winner’s circle. In the annual JBH 100 at Monadnock, Josh King won his first GSPSS feature and then Garrett Hall scored the win on the night before the Oxford 250. In the final three races – Squeglia won twice – while Derek Ramstrom took a home-track victory in the Sunoco World Series at Thompson. Granite State Pro Stock Series president Mike Parks weighed in with comments looking back at the 2017 season, as well as looking ahead to 2018. Keep updated with the latest news from the Granite State Pro Stock Series over the offseason by following the series on social media or visiting www.gspss.net.